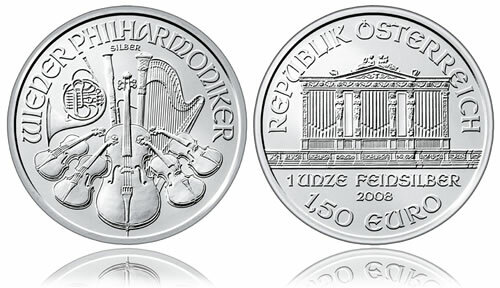 The Austrian Vienna Philharmonic Silver Bullion Coin was introduced in 2008, expanding on the interest seen for the Gold Philharmonic Coin that debuted almost twenty years earlier. Each silver coin is struck from one ounce of 99.9% pure silver with a face value of 1.5 Euros. The coins are produced by the Austrian Mint which has a long and illustrious history. It dates back to at least 1397 and is known to have struck silver coinage from the ransom paid for King Richard 1 of England (Richard the Lionheart). Featured on these specific strikes are images related to the Vienna Philharmonic, which itself has quite a history and is considered by many to be one of the best orchestras in the world. The orchestra was originally established in 1842 by Otto Nicolai who formed the Philharmonische Academie. Since its creation, the orchestra has operated under a democratic principle which involves major decision being voted on by its members. The Philharmonic routinely performs in the Wiener Musikverein, a structure built on land donated by Emperor Franz Joseph which opened in 1870. Inside the Musikverein is the Golden Hall which houses the great organ that was installed in 1907. Of interest, the Golden Hall was not built to the accepted acoustic standards known today and is long, narrow and tall. It measures approximately forty-eight meters long, nineteen meters wide, and eighteen meters high but still seats over 1,700 people with room for another 300 standing individuals. The great organ is showcased on the obverse of the Austrian Vienna Philharmonic Silver Bullion Coin. Surrounding the organ are inscriptions of "REPUBLIK OSTERREICH," the face value, size and purity of the strike. The reverse shows a design including eight different instruments used routinely by the Vienna Philharmonic including a string bass, cellos, violins, a bassoon, harp and Viennese horn. Also shown on the reverse is the inscription "WIENER PHILHARMORIKER" for "Vienna Philharmonic."